Yup, you're exhausted, but you're not done yet! When you get home ,you have a few more chores to complete. Thoroughly rinse everything with fresh clean water. Your CFD’s, bathing suites, wetsuits, surfboards, etc. Lay your wetsuits in a location out of the sun to dry. Rinsing all of your equipment will prolog its useful life. In time, salt water will destroy anything and everything! Because most Dog Beaches are at river mouths, we wash our dogs every time we return from surfing. The result is that we have never had any skin issues with our dogs. What you do is entirely up to you. If you don’t wash them, at least watch for any skin issues that might develop. We purchased a stand-up dog bath from Costco online. They are made here in San Diego and will really save your back. One end is open so they can jump in and out. We also purchased a commercial blow dryer from and online pet supply house. 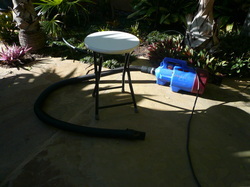 It has two speeds and not only dries their long thick coats, but it blows out all the remaining sand. Let’s keep it outside and not in the house! New ones are available that will vacuum as well. We also rinse our Surf Dog’s ears with an ear rinse we purchase from our Veterinarian. This helps keep the ear infections to a minimum! Another option is to stop at a Dog Wash on the way home. Yup! Dog wash facilities are popping up all over town. They have everything you need and you'll leave the mess there, not at home. A few here in San Diego are listed below. Now it's time for everybody to take a well deserved nap! This really saves your back. And if you have more than one dog, it's a must! Others are avaiable. You can spend more or less. Just 2 blocks from Dog Beach, has been open since 1993 and are So. California's premier self-serve dog wash.
Lots of service and accessories! Open 7 days a week, 7 am - 9 pm.